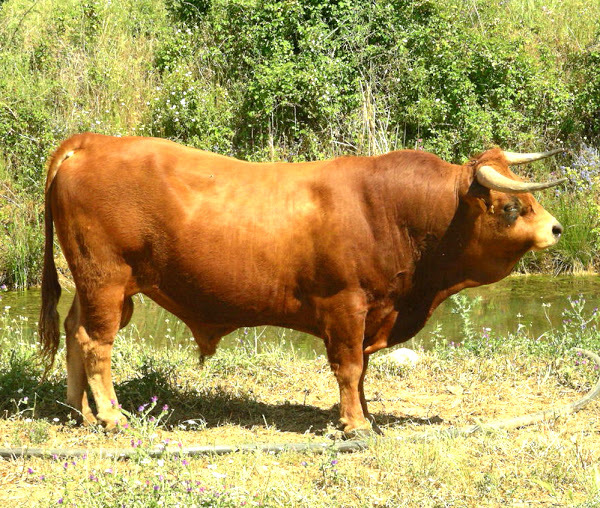 Arouquesa are relatively small cattle from Portugal. They are raised for both milk and meat production. They are found almost exclusively in the Northern Portuguese districts of Viseu, Braga, Aveiro and Porto. They were granted protected geographical status of Denominacao de Origem Controlada (DOC) from the European Commission. They are light brown; although the bulls may become a little darker than the cows. Both bulls and cows have horns. Their horns are large which are wide and are directed forward, first down and then up. They have pretty strong legs, and their hind legs are very muscular. The bulls can reach a height of about 134 cm, and the cows about 123 cm. Average live body weight of the mature cows vary from 350 to 400 kg. And the mature bulls on average weight between 360 and 430 kg.